Product prices and availability are accurate as of 2019-04-16 15:27:31 UTC and are subject to change. Any price and availability information displayed on http://www.amazon.com/ at the time of purchase will apply to the purchase of this product. 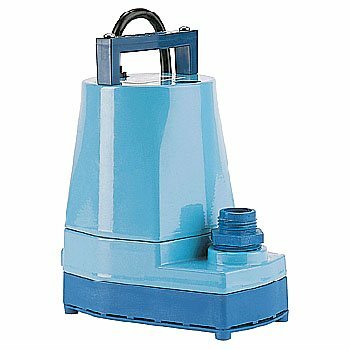 5 Series: 1/6 hp Submersible Sump/Utility Pump with cast aluminum housing, plastic base, bottom sump-type pick-up with removable plastic screen, pumps down to 1/8", thermal overload protection, 1" FNPT discharge with a garden hose adapter. 5-ASP features a diaphragm pressure switch with "on" level at 6" to 9" and "off" level at 1" to 4" 5-ASP-LL features a low-level pressure diaphragm switch with "on" level at 2" to 3" and "off" range at .5" to 1.5" 5-ASP-FS features an integral float switch with "on" level at 9" to 14" and "off" level at 1" to 5"